KELLAM, Lynda (2018) Preserving Electronic Government Information in the United States. Paper presented at: IFLA WLIC 2018 – Kuala Lumpur, Malaysia – Transform Libraries, Transform Societies in Session 153 - Poster Session. Access to government information is an integral part of our heritage in the United States. In the 1800s, the federal government began distributing publications to American libraries, and with the Printing Act of 1895, Congress created the Federal Depository Library Program with the purpose of distributing government information and data. Through the FDLP, our researchers have access to a wealth of government products, which provide in many cases the foundational materials for telling their research stories. In recent years, the changing information landscape has disrupted this workflow, especially as government information and data have become available in digital formats. 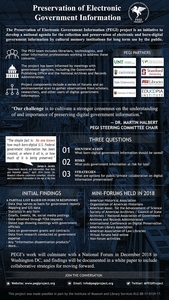 Librarians and other information professionals from a variety of universities and organizations in the United States are undertaking a two year project to address national concerns regarding the preservation of electronic government information (PEGI) by cultural memory organizations for long term use. 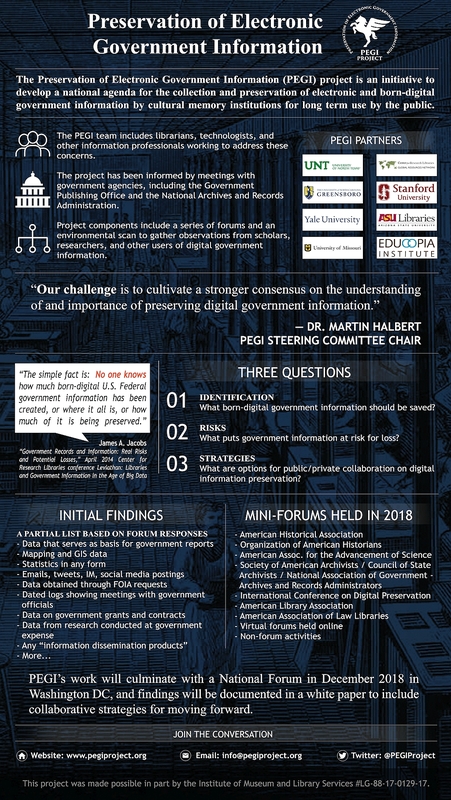 The focus of the PEGI project is at-risk digital US-based government information of long term historical significance both for researchers in the United States and around the world. This session will provide attendees with an overview of the PEGI Project and will encourage discussion about preservation of digital-born information and data that will help to inform the project's outcomes.